Q: Can you tell StubbyDog readers about your book “Pit Bulls & Pit Bull Type Dogs,” which is part of The Photo Book Projects you create? 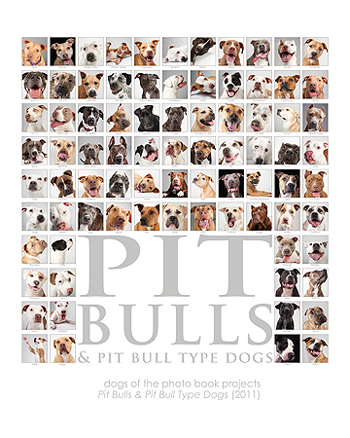 A: The photo book “Pit Bulls & Pit Bull Type Dogs” contains over 80 portraits of dogs that would be labeled by the public as “pit bulls.” So there are American Pit Bull Terriers, Staffordshire Bull Terriers, all sorts of pit mixes and even American Bulldogs, since many people confuse them with pit bulls. It’s any dog that would face discrimination because the dog has a certain look. I call them 80 dogs the media doesn’t want you to meet. A: I never had much experience with pit bull type dogs until I started photographing dogs and started volunteering at my local shelter. I met dog after dog that wanted nothing more than to wag its tail and lick my face. It didn’t take long for me to realize these dogs had an image problem. While we were traveling the country two years ago to photograph for the “Deaf Dogs” and “Rescued in America” photo books, I met even more of these dogs, since both books contain a large number of pit bulls, and I also stopped at shelters and rescues all across the country. It was then I realized there was a crisis going on. These dogs were languishing in shelters not just in Philadelphia where I live, but all across the country, and they were banned in other parts, all because of public fear caused by media hype. I knew during that trip that I wanted the third book in the series to be about these dogs. I want to rebrand them as the dog next door, which is how they used to be seen – as great companions and family pets. Q: How were you able to raise so much money for the book (almost $20,000!)? A: All through social media. Many people knew about the project, and when I asked if they could help spread the word, they did. Q: Do you have advice for other people trying to raise money for a pit bull charity or special project? A: Partner with others who have an interest in what you are doing and have a large audience of their own, whether that’s an individual, an organization, a nonprofit or a business. Then give them something they can share with their audience so that they aren’t just asking for donations, pre-orders or whatever. I made a video that featured details about the book and also photos from the book. People were happy to share a video with cute photos of these dogs and a positive message about pit bulls. The video showed the photos and the message behind the book, and people were happy to pre-order after viewing it. Give others something they can share, and make that thing less about the donation or order and more about the reason why you are doing it. Q: What was it like traveling the country and photographing pit bulls? A: It was wonderful. I love road trips and I brought Sadie with me – she’s my deaf rescued dog and inspiration behind The Photo Book Projects as a whole. I think the best thing is really meeting all of the great dogs and meeting so many people who are passionate about these dogs. Many of these people were unsure about pit bulls, or unsure about adopting an ex-fighting dog, or unsure about any number of things until they adopted their dog. However, they were willing to take that chance, and in doing so, the dogs have educated them about compassion, trust, forgiveness and prejudice; and they continue to educate the people’s friends and family, and people they meet every day. It’s a wonderful ripple effect. It all leaves you with a great sense of hope. Q: What’s your favorite memory from your pit bull photo journey? A: There were so many. I was honored to meet Sarge just a few days before he passed away. I visited Animal Farm Foundation and BAD RAP, which were definite highlights for me. I photographed Oogy and 10 of the former Michael Vick dogs who are all so special for how they have opened people’s eyes and helped change the fate of dogs seized from fight busts. But truly the real joy in doing what I do comes from meeting the people and their dogs, hearing and seeing first hand what wonderful homes these rescued dogs now have, and hearing how these dogs have changed their people’s lives. Q: Do you have a pit bull yourself? What first got you involved with the breed/why pit bulls? A: No, I don’t have a pit bull. I have a deaf Border Collie mix, which according to the DNA test I did is actually German Shepherd and unidentified terrier … so who knows. She could be part pit bull! 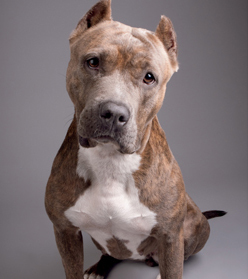 I would like to adopt a pit bull one day— most definitely a deaf one! The Photo Book Projects are really about educating people about dogs that are often wrongly treated and/or discriminated against, and teaching not to stereotype but instead treat dogs as individuals. 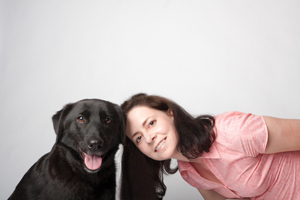 I started with deaf dogs, then rescued dogs. Then, for the reasons I stated earlier, I felt the third book needed to be on pit bulls, since they are so in need of our help. 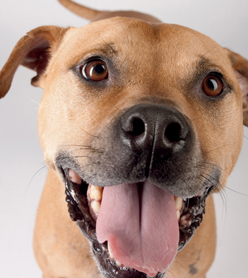 Q: If there was one thing you could convey to the general public about pit bulls, what would it be (in one sentence)? A: Pit bulls aren’t villains, demons, monsters – they are dogs, just dogs! A: I would give pit bulls superpowers so that whenever someone came within 100 yards of a person, that person’s prejudices would be erased – not only prejudices against pit bulls, but all prejudices. How amazing would that be! I sort of think these dogs already possess the power to erase prejudices against pit bulls though. They educate people every day by just being themselves. 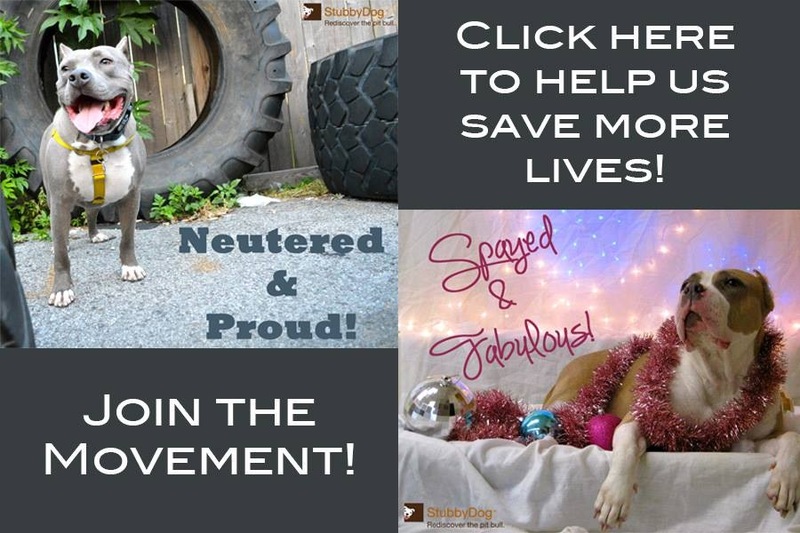 Melissa (photo above) is donating a signed copy of the above collage that features all the dogs in her book for StubbyDog’s Art Auction Fundraiser. I’m actually looking for people to donate to a film I am making about a dog and it being rescued. We must show the world how truly important dogs are! i love your work, I am teaching myself photography right now and Pit Bulls are my favorite subjects. I hope to be able to use the photos in my art projects to to open hearts to seeing them in a new light. At this point I am a hit and miss photographer with a lot of inspiration and an old camera. Thank you for using you art to help those that need it so much. Thank you for sharing your talent , helping those that can’t speak for themselves. I love your work !! I am definately adding this book to my must have collection. As a Pit Bull lover and advocate I applaude Melissa’s efforts to educate people on the wonderful breed that has such a bad rap. Hi, myself deaf, dont mind my stink english. Im blessed to see about deaf dog and rest of another dogs that you guys are theirs hero of trying to find them home. I love dogs in my whole heart that no one can ever beat this. I grew up lived outside with homeless dogs, actually over 100 dogs. Now am adult, I work at vet, dog caretaker, and just founded awesome links, makes me come back check on face book all the time to see any new dogs come up needs a home and I forward to spreading to friends. I want to help more than that. Feel not enough still. I know next year will be a chance after buy a ranch home to starting a business, Animals Inn & rescues. I cant wait……. Maybe we can be a team, am in middle of USA (North Dakota) they r welcome to bring at my place until find a home without date due, no rush no PTS no abuse. Give them time to find a home is what I wanted. Pray for this business to successful after my 2nd book get in publishing 🙂 Write my book story abt “my survivor” If no dogs in my life, I would not be here.